We are excited to announce some upcoming Women’s Events in the community! Information and pamphlets will be available at WOW this Wednesday. Check it out! The Women of Worth Ministry is partnering with Walls of Freedom for a ladies outreach day on Saturday, March 19th. There are two main ways to participate; volunteering on the day-of at their building at 294 Ellen St., or bringing donations to WOW each Wednesday morning before the event. Hygiene Items, Nail Polish and more. An information letter with more details will be available Wednesday at WOW. “Come spend a day in the palace! 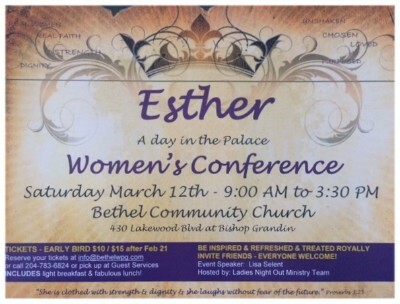 The story of Esther is amazing and we can’t wait to share it on Saturday March 12th! Be ready for lots of royal treatment and basking in the presence of the King! Tickets are $10 each if ordered by Feb 21st and will be available at WOW this Wednesday. Includes a light breakfast and fabulous lunch, coffee breaks … drama, worship, dynamic speaker, friends, table talk and more!